The deadline for articles, press releases and sponsored White Papers for the next issue of S&T Journal (e-Digest) No.2, Vol.101, February 2009 is 16 February 2009. You can submit your article or press release online. For more information and instructions of preparation click <here>. 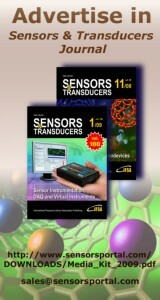 This report analyzes the worldwide markets for Smart Sensors in Millions of US$. The specific product segments analyzed are Smart Flow Sensors, Smart Pressure Sensors, Smart Temperature Sensors, Smart Position Sensors, and Smart Load Cells. The report provides separate comprehensive analytics for the North America, Japan, Europe, Asia-Pacific, and Rest of World. Annual forecasts are provided for each region for the period of 2000 through 2015. The report profiles 71 companies including many key and niche players worldwide such as ABB, Analog Devices Inc., Custom Sensors & Technologies, Inc., Delphi Automotive Systems, Eaton Corp., Emerson Process Management, Honeywell, Infineon Technologies AG, Invensys PLC, Motorola, Inc, Oceana Sensor Technologies, Omron Corp., Raytek, Robert Bosch Corp., Siemens AG, Vishay Intertechnology, Inc, Wilcoxon Research, Inc., and Yokogawa. Market data and analytics are derived from primary and secondary research. Company profiles are mostly extracted from URL research and reported select online sources.